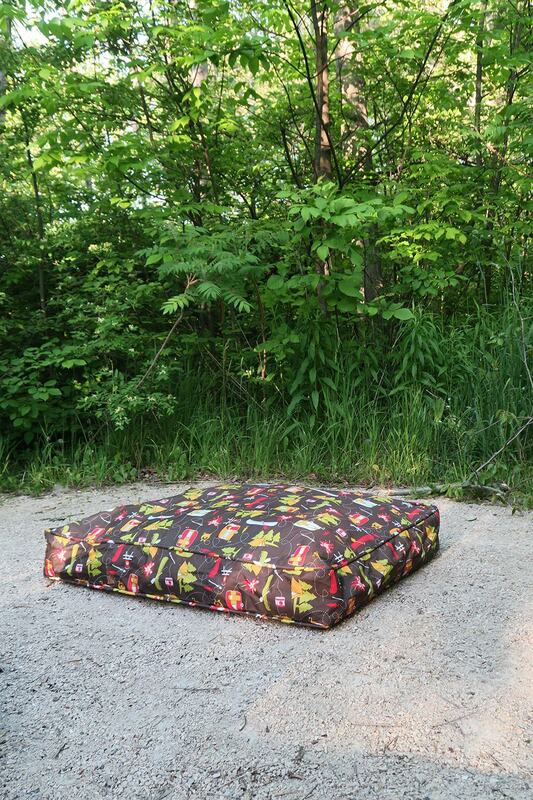 Headed out on your next camping trip with Fido? 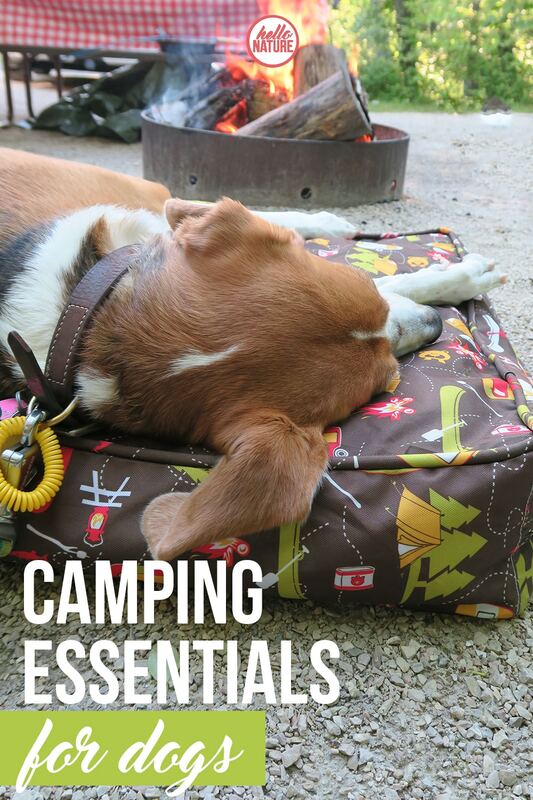 Make sure you don’t forget anything and check out our camping essentials for dogs list! One of the reasons I love camping is because it’s generally super dog-friendly. In fact, it’s one of the few lodging places that it’s harder to find a campground that doesn’t allow pets than it is to find one that does. 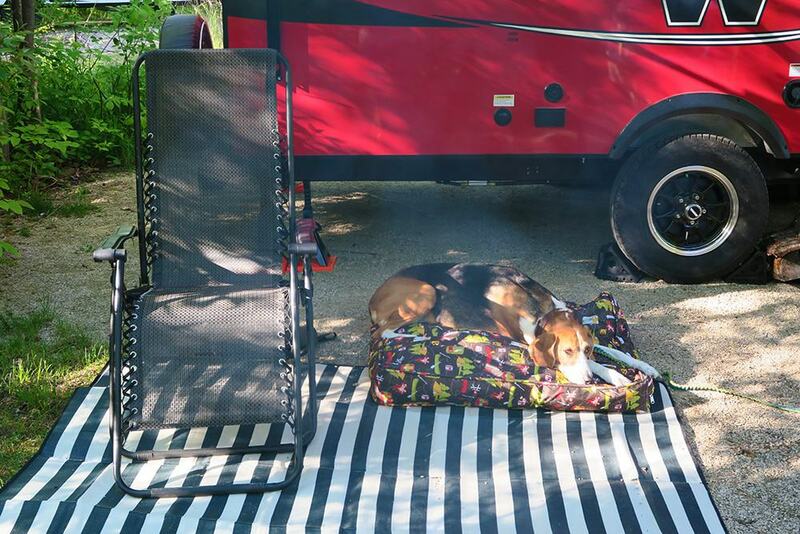 We’ve been camping with all of our pups over the years and we’ve come to find there are some must-haves for each trip. 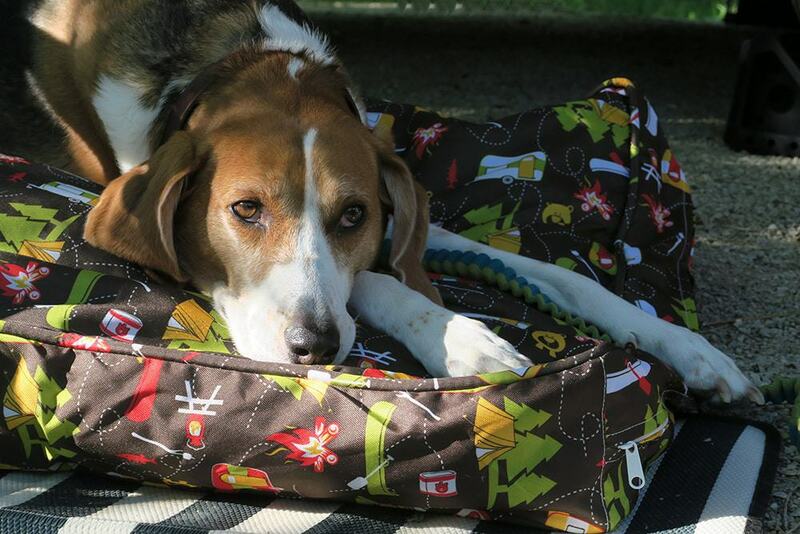 Here is a list of our camping essentials for dogs. Dog ID tags are must no matter what for us, but especially when traveling. We’ve never had an issue with our dogs breaking free from a leash or getting loose from a tent/trailer, but it’s better to be prepared. Especially when you aren’t 100% familiar with the area. We included my parent’s phone as a third number on the tag just in case we don’t have service in the area. Also, remember to have your vaccination records/tags as some campgrounds or other places you may visit require them. A well-designed harness can make life so much easier when we’re camping. With all the new scents or other pups, both of our hounds are big into pulling. Having the harness prevents them from choking and helps us better control them as well. It doesn’t matter how good your dog is – you need to have them leashed. It’s usually in the campground rules, but it’s also for their safety. Your pup will be in a new environment so this helps ensure they stay close. Otherwise, they could be chasing animals, running into the woods, going up to other (potentially vicious) dogs or going up to people that aren’t super dog-friendly. We recommend this waist bungee leash as it’s great to have around your waist, a tree, or something sturdy. We also like this two-handled leash for keeping a dog closer to you when/if you need to. Depending on the setup of the campsite, you may be able to use a tie-out cable as well. Bring the same food you normally feed them to avoid an upset stomach. They’re also much more likely to eat it. However, I have noticed that when we travel, Sookie is less likely to eat as much though. So sometimes, we’ll change up the flavor of her normal food (for example, from chicken to fish or duck) or some tasty lean meat and she likes the newness enough to resume eating like normal. Always bring fresh water for your pup, too. They need it as much as you do! This elevated food and water bowl with storage is a great option for food storage and serving. I’ve talked about Molly Mutt before – Eco-Friendly Dog Beds with Molly Mutt and Why Every Pet Owner Needs a Molly Mutt Duvet – and I’m excited to talk about their beds again! We got a second one specifically for our camping trips for two reasons. A) Who doesn’t love this 100,000 fireflies print?! ALL THE HEART EYES! and B) It’s made for our outdoor adventures. It’s made with water-resistant fabric so it’s designed to keep your bed’s insides nice and dry. Not only did Sookie love it (as if the photos didn’t give it away) – it was SO easy to clean off. Dew? No big deal. Rain? No problem either. Dirt? None left after brushing it off. It looked brand new after a few days of camping and that can’t be said about anything else we took with us! For obvious reasons. Please always pick up after your pet, wherever you are. Consider one of these bio-degradable poop bags. Reflective attire is great for night hikes or walks around the campground. Even better if it’s for you and your pup, if possible. But specifically with your pup, it’s much easier to see your furry friend in the dark with something reflective or blinking. Whether it’s for walks, letting them go potty in the middle of the night, or in the rain – a reflective vest is a great option. It’s always helpful to have a first aid kit for your dogs on hand just in case. I have this pet first aid kit with printable post that can help you put everything together, too. Our pups always gets dirty while we’re camping. A brush along with brush spray or waterless shampoo can be a lifesaver. These are especially helpful when you end up with a wet dog from the lake or rain. Towels come in handy with this, too. You might also want to check out How to Calm An Anxious Dog if your dog is prone to anxiety or stress when they’re in unfamilair places! I’d love to know: what is on your camping essentials for dogs list? We love camping and usually take our dogs too. These are mostly our list as well, other than the bed since we go backpacking a lot. I would include a well-fitting backpack for the dog (ours carry water for themselves and usually the kids) and we keep a copy of their vaccine records and vet phone numbers in the glove box now. Good tip on the vet and vaccine records, Jamie! We need to start doing that! Thank you for this post! I’ve been wanting to take my dog camping with me, but I was very nervous that I don’t know what I’m doing. This helped a lot! Aw this post was so thoughtful, and your pup looks very cozy! He looks so comfortable! I never thought that it would be necessary to bring essentials for a pet on a trip. Good read! Thank you so much for this info! My family hasn’t taken my dog camping yet but we’ve been looking into it. That bed looks amazing! I love anything that’s easy to clean haha. Easy to clean is a must with pets! (And kids, haha) I hope you’re able to go camping with your pup soon! I never would’ve thought that dogs would require so much to go camping. I’m glad you put this together though so I can reference it on a future camping trip! Great list! I am obsessed with that dog bed it’s so cute and amazing that it’s water resistant. 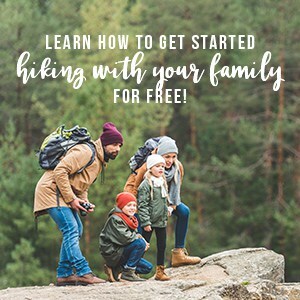 Lots of great tips here that not everyone will think of! Great list! I love that bed – it looks like something our dog would love, especially if we took her camping with us. 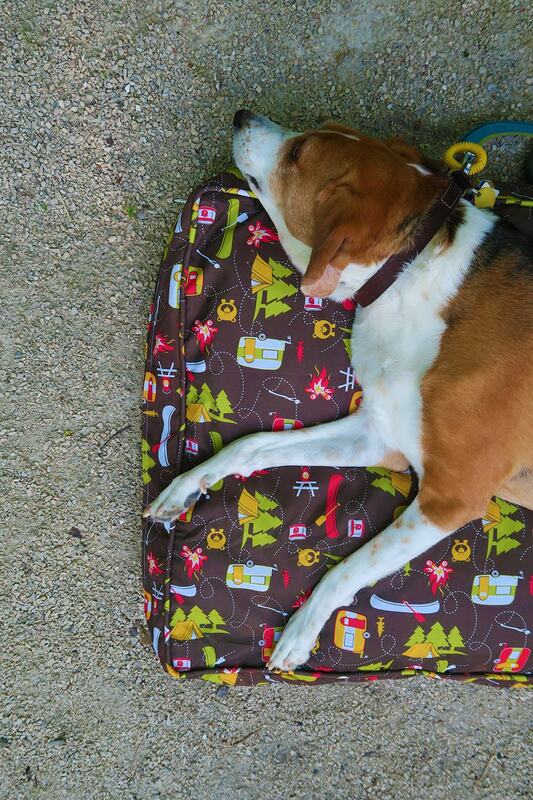 Love that Molly Mutt cover — just adorable (like your pup)! Great tips, thanks for sharing! This is a great list! We took our dog camping for the first time last fall, and he loved it. The dog bed you have is so cute! So fun! 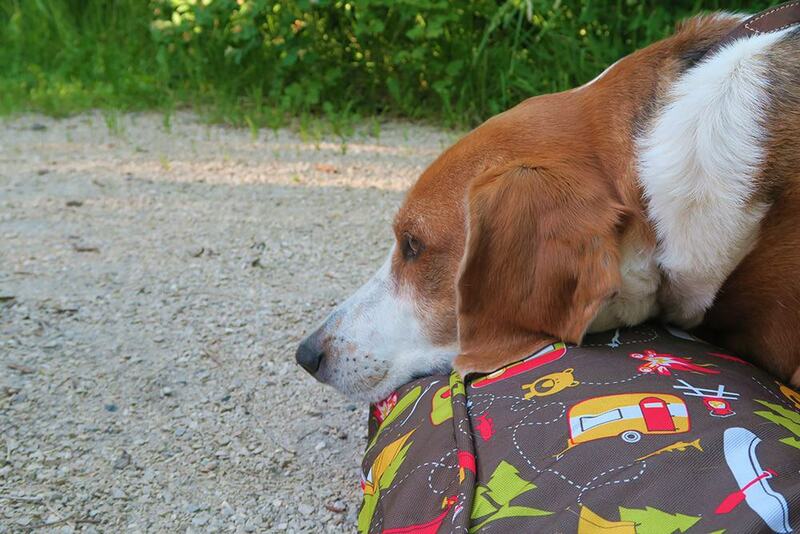 Dogs make camping trips way better, in my opinion ;) And isn’t it? The print is perfect! we travel with our pups a ton and I really need to get a travel first aid kit, that is a great idea! I have a travel water bottle for our pups that is essential! We keep one in the car too! Do you have a specific bottle you’d recommend, Kristen? We always grab one of our water bottles and wish we had a better one for her! Never even thought of a water resistant bed! Great essentials. Thanks, Alix! It helps a ton with the unpredictable weather we’ve had. I love your dog he is so cute. I love going camping but I do not have a dog, but I also would have never thought about some of these essentials. Don’t forget their tooth brush, good oral hygiene makes sure their teeth last their lifetime!! Don’t forget their favorite toys and treats, along with a current photo of Jax in case he goes missing. Best to carry along bottled water for them as to not upset their tummies!! Love this article! Where did you get that leash/tether she is using in the last pic? I have been looking for a tether for my pup that has a bungee cord like component. Thanks!